You may remember from a previous post how I showed you how to add some crosses to your cut-off shorts, well here is how you can add some patterns to your jeans. This is basically the same method as before just on a larger scale. 1/ Lay your jeans flat on the floor. 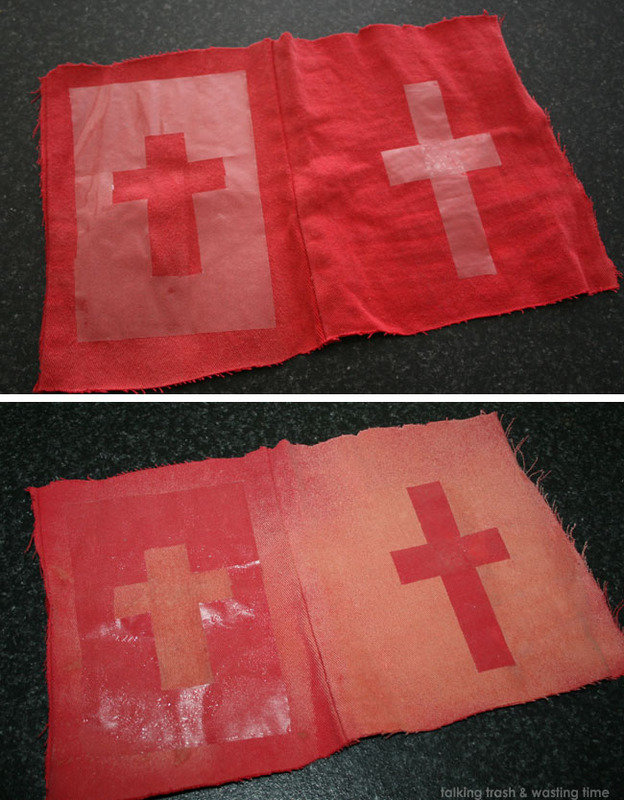 To create crosses I used different size sticky tape and randomly put on jeans. You could do this in a pattern and or however you like, I was just testing so did not fully cover the jeans and was trying different sizes to see what worked. 2/ Spray with pure bleach. Work fast so you get the jeans even in developing time. 3/ Let jeans develop. Time depends on type of denim and really just how you want the jeans to look. 4/ Once you are happy with the faded colour then peel off the tape/stickers and wash the jeans. Now my crosses look like they are about to take off like a rocket ship hahaha but this was because I sprayed too much bleach onto the actual tape and because the jeans were hanging up the bleached dripped down tape and too much bleach ended up under the crosses. So if you do not want your pattern blasting off then please read below. If you do want your pattern to look like they are on fire then hang jeans upside down. 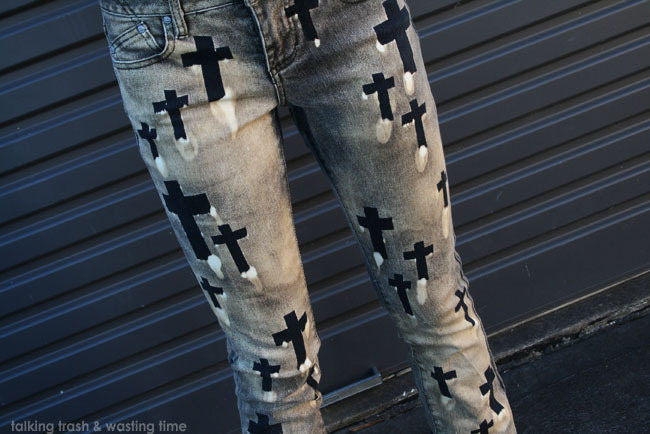 When I looked at these jeans upside down, the crosses really did look like they were on fire, great effect. I decided to test a scrap piece of denim to see how this would work on colours. Above I did the inverted pattern too, both turned out well. I like how the red turned out, I think doing this on coloured denim is quite cute. Wow! This is such a great DIY, love the results! Love this! Such a good idea! You've been nominated for an award! Go to my blog to collect it!